One of New England’s time-honored winter traditions is bundling up the family to go skating on a frozen pond. 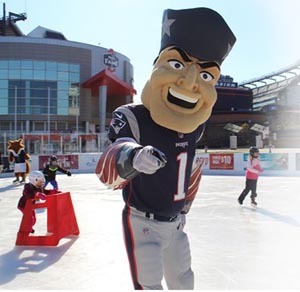 Patriot Place is both honoring and updating that tradition with Winter Skate, a professionally maintained and easily-accessible ice skating surface located conveniently next to all of the amenities at Patriot Place in Foxborough. The 60-by-140-foot, refrigerated ice surface is designed specifically for recreational skating, non-contact hockey and figure skating. The rink features an observation deck for non-skaters. Large enough to accommodate beginners and experts alike, the professional surface provides ideal skating conditions at all times. On-site skate rentals, concessions and bathrooms are available and parking is free. Patriot Place, New England’s premier shopping, dining and entertainment destination, is just a short walk away, offering 19 restaurants, a variety of shopping options, a 14-screen Cinema de Lux movie theatre and one-of-a-kind attractions like Splitsville Luxury Lanes™ | Howl at the Moon | Topgolf Swing Suite and the Patriots Hall of Fame presented by Raytheon. We went by and tried it and it was really nice but even though we were dressed for the weather, it was just too cold. The price is very reasonable and it's very well organized.... p.s. Just wondering why they do not include Brockton on the 'Town Week' for the discount.